There is an opening for the position of a Program Officer at the International Centre for Investigative Reporting, ICIR. 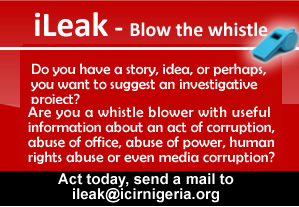 The ICIR is an independent, nonprofit news agency that seeks to promote transparency and accountability in Nigeria through robust and objective investigative reporting, with a mission to promote good governance and entrench democratic values by reporting, exposing, and combating corruption. The Centre is a member of the Global Investigative Journalism Network, GIJN. The Program Officer position calls for a professional who must have experience in project design, implementation, reporting and monitoring and evaluation (M&E). She must be able to work on or coordinate several simultaneously running projects and work with minimal supervision. She must also have experience working in and/or providing direct support to other departments and collaborating with others to achieve organizational and project goals. In addition, she must responds flexibly and capably to a range of work-related requirements such as: (1) providing information on programs; (2) tracking unsolicited proposals; and (3) liaising with the Finance Department for seamless budget implementation and carrying out other assignments as directed by her supervisor. The successful candidate must be based or be ready to work in Abuja, and be ready to resume work immediately. Analyzes information/databases on potential and actual funders. Please send your CV and a one-page cover letter describing your experience focused around the skills relevant to this job to info@icirnigeria.org on or before close of work on Monday May 15, 2017.